Premier Judgment Collections is a company experienced in the enforcement of unsatisfied judicial judgments. We will process your judgment without an application fee or up-front costs of any kind. We take all the risk and expense involved in searching for the debtor’s assets. We process your judgment on a contingency basis. All expenses and legal costs incurred in the enforcement of your judgment are advanced by us. The fact is – almost 80% of all judgments are never recovered. Your judgment may have been awarded by the court but enforcement is your responsibility. Believe it or not, many attorneys fail to take the critical necessary to ensure that your judgment liens rights are properly perfected. We review your judgment and take all the necessary steps to see to it that all steps are taken or corrected to create a valid lien on all available real and personal property of the debtor. If you have a valid court awarded monetary judgment of $5,000 or more, we will use every method at our disposal to recover the full amount of the unpaid judgment. We will track the judgment debtor down even if they have moved to another state. We have High Power Databases that allow us to locate the debtor and any assets they may have. We routinely enforce our client’s judgment by locating active bank accounts and garnishing them and all available receivables. Should the debtor have real estate or personal property, we will instruct the sheriff to attach and sell all property necessary to satisfy your judgment that was legally and rightfully awarded to you by the courts! We are currently accepting judgments awarded only in Florida. Our Associate Members are able to service your Judgment Collection needs while using resources and team effort where required to get past the obstacles a debtor will place in your way to prevent you from collecting on your judgment. To get started please fill out the application link and one of our specialist will review your case and contact you as quickly as possible. Premier Judgment Collections has over 16 years of judgment recovery experience, and is incorporated in the State of Florida and is located in the Wellington area. While our base of operations is in Palm Beach County , we have serviced clients throughout the entire state of Florida. Premier Judgment Collections client base includes attorneys, financial institutions, corporations and individuals all of whom rely on Premier Judgment Collections to obtain and provide comprehensive asset search and collection of civil judgments. Our company founder, Patricia Garcia, is a former judgment collection specialist with over 15 plus years experience in skip tracing, asset research, and judgment recovery. Patricia has training in judgment enforcement in Florida with LORMAN EDUCATION SERVICES. Premier Judgment Collections uses the finest investigative database to provide the best-in-class access to relative debtor information. Our judgment recovery method includes serving, garnishing, levying the judgment debtor, reporting to the credit bureaus and enforcing the judgment and at times employ the services of an attorney. Our Associate Members are able to service your Judgment Collection needs in Florida while using resources and team effort where required to get past the obstacles a debtor will place in your way to prevent you from collecting a judgment. I am an individual, and I have a judgment. Will you take on my case? If you have a valid court awarded judgment of $5000 or more, we will use every method at our disposal to recover the full amount of the unpaid judgment plus any interest that the judgment has accrued since it was issued. We will track the judgment debtor down even if he or she has moved to another state. We have access to both private and public databases that allows us to ‘skip-trace’ the debtor and to locate any assets that he or she may have. As allowed by law, we will garnish wages, attach bank accounts, and seize assets as necessary. If possible, we will try to do so without any notification or confrontation. We will enforce the judgment that was legally and rightfully awarded to you by the courts! We are not a collection agency. Collection agencies process debts in bulk. They send out thousands of nasty letters and call debtors to try to get them to pay. We are different. We actually “take assignment” on your judgment. Then we have the authority to pull credit reports, conduct thorough asset investigations, including surveillance, bank locates and more, and even bring your debtor back into court. Our cases are treated individually and expertly. We are not afraid to put out money for enforcement procedures. And we have resources that collection agencies will not. Can I use an attorney for judgment collection? Yes you can. However, an attorney will charge an hourly fee of $175 to $250 per hour. Also, while many attorneys are skilled at judgment recovery, most are not familiar with effective post-judgment strategies. How much will the judgment recovery cost me? It costs you absolutely nothing. We would be responsible for all fees and cost. If there are additional court expenses, we petition the court to add these to the judgment collection. We work with attorneys at no cost to you. A judgment entered in the court of the State of Florida generally may be enforced within twenty (20) years from the date the judgment was entered and earns interest. What is an “Assignment of Judgment”, and why is it necessary? The only recognized legal entity empowered to pursue a recovery is the judgment creditor. For Premier Judgment Collections to be legally empowered to begin a recovery, an Assignment of Judgment must be filed with the court-of-origin. The Assignment of Judgment establishes Premier Judgment Collections as the judgment creditor. After the Assignment of Judgment is recognized by the court-of origin, Premier Judgment Collections is then given the legal right to enforce the judgment. As well as providing the legal means to collect, the Assignment of Judgment also protects our clients, as it sets forth the legal clarity which obligates Premier Judgment Collections to share the proceeds with the original judgment creditor. Does Premier Judgment Collections offer a guarantee that my judgment will be collected? The debtor has assets available for seizure in accordance with state laws. Keep in mind that, we are only profitable when our clients are, and therefore, for those cases we accept, we exhaust every possibility to make a successful collection. How long will it take to collect my judgment? Some cases may yield a recovery in 2 to 4 months. Many cases, if not most, take longer. Cases in debtor-friendly states are especially difficult, and may take many months, or even years, to yield a recovery. Then there are other cases that will simply prove to be “uncollectible”. Be wary of a company promises a quick return on your judgment collection. A better strategy is patience. It takes time to insure that you receive a maximized recovery that is conducted in accordance with the law. 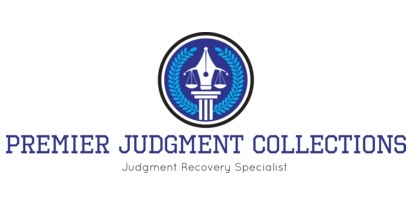 If you have a substantial case with a high potential for recovery, then Premier Judgment Collections will exhaust all the alternatives to make a successful recovery. You will receive your proceeds directly from Premier Judgment Collections attorneys escrow account. After Premier Judgment Collections receives monies from a partial or full recovery on the judgment from the courts, the debtor, or an attorney, we send the creditor a check for their agreed-upon portion. We include a photocopy of the original check to insure our clients’ satisfaction with the agreement. Our standard turnaround time in paying our clients is 15 days or less, depending on the type of funds we receive.